Of all the state-sanctioned killings North Korea has allegedly conducted under the regime of Kim Jong-un—and there have been many—probably none are as bizarre or as brazen as the accused murder of Kim’s own half-brother, Kim Jong-nam, at the Kuala Lumpur International Airport in Malaysia on Monday. If true this could lead to the U.S. again naming North Korea a terror-sponsoring state, and thus more sanctions, but at this point nothing is likely to stop the state’s pattern of high-profile assassinations. According to news reports, two women approached Kim Jong-nam at the airport where he was awaiting a flight to Macau, then poked him to death with poisoned-tipped needles before escaping in a taxi. Officially, Malaysia’s Police Chief Fadzil Ahmat told state media that one of the women also placed a cloth over Kim Jong-nam’s mouth that was laced with poison. He was sent to a hospital but died en route. Unquestionably, that’s a fucked up way to die. And an odd one. Another oddity: one of the women was supposedly wearing a sweatshirt with “LOL” on the front. Since then three suspects have been arrested: 26-year-old Malaysian national Muhammad Farid Bin Jalaluddin, his girlfriend 25-year-old Siti Aishah, and a woman with a Vietnamese passport, 28-year-old Doan Thi Huong. At the moment their possible relationship to North Korea has not been disclosed. The circumstances surrounding Kim’s death are still being investigated, but none of this sounds out of step with what we know about North Korea—which is very little, but we tend to think their leadership is completely insane. Or at least Kim Jong-un, North Korea’s dictator, is. Kim Jong-nam was 45, and in addition to being Kim Jong-un’s half-brother, he was at one point the favored son and presumed successor to their father, the notorious Kim Jong-il. After all, Kim Jong-nam was the eldest son. But in 2001, Kim Jong-nam was arrested attempting to sneak into Japan with a fake Dominican Republic passport so that he could go to—wait for it—Tokyo Disneyland. Kim Jong-nam was ejected from the country and sent to China. The incident was considered highly embarrassing for their father, leading Kim Jong-nam to fall out of favor. He reportedly lived in exile outside North Korea, sometimes serving as a critic of the autocratic country, for years while his younger half-brother Kim Jong-un took over his father’s regime. Kim Jong-nam had arrived in Malaysia last week, Mr. Lee said. He was in line at the airport to check in for a flight to Macau on Monday morning when he was attacked by the two women, Mr. Lee said, citing security camera footage from the airport. The women fled the airport in a taxi but were still believed to be in Malaysia, Mr. Lee said. The New York Times reported in 2015 that the dictator killed 68 senior officials between 2012 and 2015, some of them by machine gun fire. In 2013, he had his uncle, Jang Song-thaek, the second most powerful man in the country at the time, killed. Reportedly by antiaircraft machine fire. His crimes? Allegedly trying to overthrow Kim, and also slouching in a meeting. Who the hell knows? Job security seems hard to come by in North Korea. Indeed, this Kim Jong-nam murder sounds too weird to be true, but there’s a reason why North Korea is called the “Hermit Kingdom.” This reads like a Hermit Kingdom-style assassination. The problem is that there is nothing fictional about what is the second family member Kim Jong-un had iced. 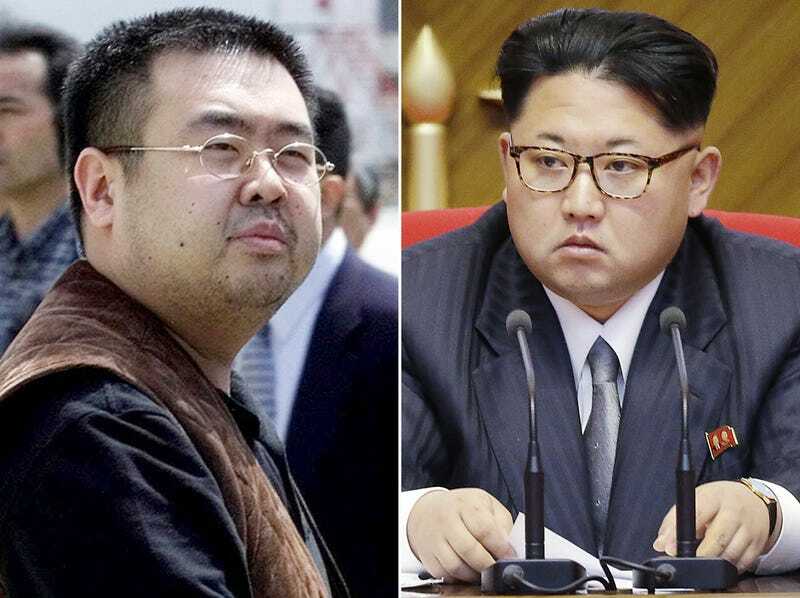 Cheong Seong-chang, an analyst at the Sejong Institute, a think tank in South Korea, said if it is confirmed that Kim was behind his half-brother’s murder, Washington could face pressure to put North Korea back on the list of countries that sponsors terror. I’m not sure Kim would lose any sleep if the U.S. decided to do so, though. For Kim Jong-un, it would likely be just another LOL.